Powers/Abilities: Vormund possesses an aura that absorbs kinetic energy he can redirect at an opponent. By aiming this energy at an opponent's heart, he can kill them instantly. Under normal circumstances, he uses the stored energy to provide himself with greater endurance in a battle, increase his speed (peak human level), strength (lifting 1 ton) and durability (rendering himself bulletproof). 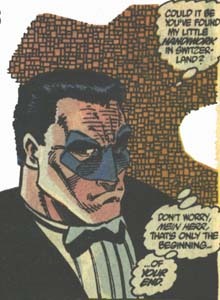 (Captain America: America's Avenger - Vormund profile) - Kommando Spezialkräfte ("Commando special forces") graduate Markus Ettlinger was granted superhuman abilities through genetic experiments to become Hauptmann Deutschland, leader of the Schutz Heiliggruppe, unified Germany's first attempt at a national team since World War II. (Captain America I#387/2 (fb) - BTS) - Hauptmann Deutschland led the Schutz Heiliggruppe on a raid of Arnim Zola's castle in Switzerland, destroying all of the clone bodies he had kept for the Red Skull. (Captain America I#387/2) - Hauptmann Deutschland attended the Red Skull's Masque Club at the Smith Building, disguised as a party-goer. He was present just after the Red Skull learned that Zola's clones had been destroyed. (Captain America I#388/2)- Hauptmann Deutschland masqueraded as Luther "Dutch" Conrad, one of the Taskmaster's pupils, provided to the Red Skull garbed as Captain America for his workout sessions. The four actual students were slain in battle with the Red Skull, but when the Skull engaged Hauptmann Deutschland, his teammate Zeitgeist teleported them both away. 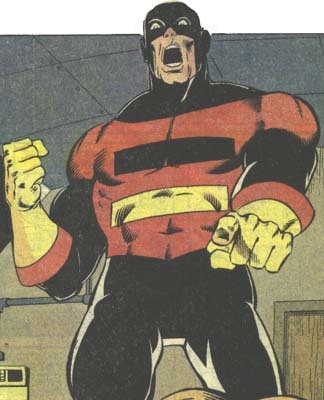 (Captain America I#389/2) - Hauptmann Deutschland, now garbed in his costume, confronted the captured Red Skull aboard the Schutz Heiliggruppe's craft as they sped towards Germany. He informed the Red Skull that they intended to place him on trial for war crimes in Germany, then met with Blitzkrieger, who had determined that the Red Skull had a homing device which was bringing his Skeleton Crew to their location. Hauptmann Deutschland had hoped this would be the case, as he intended to put the Skeleton Crew on trial as well! (Captain America I#390/2) - The Skeleton Crew invaded the hangar of Airport Schönefeld outside of Berlin where the Schutz Heiliggruppe were holding the Red Skull, but were met in battle by the team. Mother Night and Crossbones both shot Hauptmann Deutschland in the chest, but he used his power to repel the bullets and arrows. Hauptmann Deutschland was almost defeated by Crossbones, but Blitzkrieger defeated Crossbones for him. Machinesmith secretly sent a distress signal to Arnim Zola. (Captain America I#391/2) - Hauptmann Deutschland continued to keep watch over the captured Skeleton Crew while they prepared to hold their war crimes trials with Mr. Leiberthal as prosecutor and Mr. Buehller as defender of Red Skull and the Skeleton Crew. Hauptmann Deutschland also informed the Red Skull that the chair they had him bound to doubled as an electric chair. (Captain America I#393) - Just as the trial began, Machinesmith set himself and his teammates free. The Red Skull then claimed that he was not the original Red Skull, taunting Hauptmann Deutschland for having no proof that he was now in a cloned body. Before the Schutz Heiliggruppe could recapture the Skeleton Crew, three of Arnim Zola's bioplastoids (Secundus, Tertius and Quatrus) disguised as Iron Man, Thor and Captain America of the Avengers burst in, and bluffed the Germans into releasing Red Skull and the Skeleton Crew into their custody. Hauptmann Deutschland suspected something was amiss, and determined that he would look into it. Hauptmann Deutschland later contacted Captain America to see if the Red Skull had returned to America safely. When Captain America did not recognize him, he realized he had been tricked. Hauptmann Deutschland immediately set out for America, and at the Smith Building, ran into the real Captain America. Assuming he was dealing with a fake, he attacked him, managing to hold his own. Finally, he set after the Red Skull to make sure that he didn't escape, but when he broke into his office, he found the Red Skull dead, seemingly slain by Scourge. (Captain America I#394) - Hauptmann Deutschland investigated the "Red Skull's" body, but did not realize it was a fake made from one of Zola's bioplastoids. As Derek Freeman of the FBI had the body taken away, Hauptmann Deutschland asked that they release the body to his custody when they were done. (Captain America I#442) - Now named Vormund, he participated in the Schutz Heiliggruppe's investigation of several mysterious deaths among superhumans in South America, with Blitzkrieger himself being taken as a victim. Vormund later joined Zeitgeist in investigating a party held by Thomas Halloway at his manor, honoring several heroes of the 40's. Zeitgeist pointed to Halloway as a suspect, although Vormund had become suspicious of his ally. Upon their arrival, Zeitgeist created a hologram of Vormund claiming that he would kill all of the heroes gathered there. Captain America set after the real Vormund, but Vormund was merely confused by the attack. Just then, Zeitgeist attempted to stab Captain America from behind, but Captain America shrunk his foil with Pym particles. The other old heroes gathered assumed that Vormund had slain Captain America and set after him as he was forced to flee. He finally caught up to Zeitgeist, and used his powers to redirect the force of his foil's thrust back at his heart, killing him to avenge Blitzkrieger. Vormund regretted that he had never done a more thorough background check on Zeitgeist. (Mighty Avengers II#4) - Back as Hauptmann Deutschland, he and the Blue Marvel battled W.E.S.P.E. members at the Brandenburg Gate, swearing to stop the group's terrorist gas attack or die trying. Comments: Created by Mark Gruenwald, Dan Panosian, Larry Alexander and Bud La Rosa. The equipment in Hauptmann Deutschland's battle vest is similiar to what Captain America himself would carry in his battle vest during "Fighting Chance." Hauptmann Deutschland's name became a problem in Germany. Read more about it in the Schutz Heiliggruppe profile. Vormund's real name was revealed in Marvel Atlas#1. I'v heard or read that name somewhere before, but I just can't remember where.